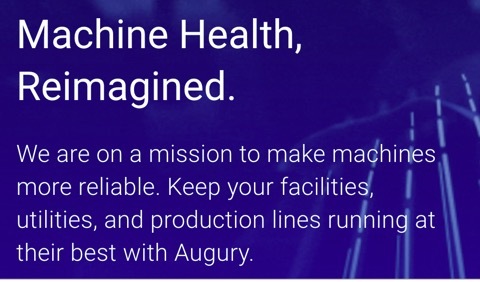 Augury counts Johnson Controls, Brooklyn Navy Yard, NYC Department of Education, and Grundfos among its customers, along with PSG Dover, Trane, and Carrier. And the startup is well-funded: Today, it announced it has raised $25 million in financing contributed by Insight Venture Partners, with support from existing investors Eclipse Ventures, Munich Re/HSB Ventures, Pritzker Group VC, and Lerer Hippeau. The Series C round brings Augury’s total raised to $51 million and comes as the company completes its purchase of Alluvium, a machine learning startup with a platform that surfaces insights from industrial data streams. Peter Sobiloff, managing director of Insight Venture Partners, and Harley Miller, principal at Insight, will join the board of directors. The new capital and acquisition will fuel Augury’s global expansion, Yoskovitz said, and allow it to better support its existing partners. He claims that having Alluvium onboard will make Augury one of the first industrial analytics companies to provide both mechanical and operational insights in a single package. Augury’s technology is engineered in such a way that it’s generalizable and improves with scale, Yoskovitz said. The recordings, which technicians take at different spots in machines, are used to establish baseline readings in Augury’s cloud. These are then compared to the sounds produced by similar appliances owned by other clients. This way, Augury doesn’t need to retrain its models for each new machine — the system over time begins to recognize abnormal sounds and other failure indicators. For example, Augury’s service might learn to spot a faulty actuator in a lifter robot and apply that knowledge to detect faulty actuators in other devices. Early on, Augury worked directly with service companies and facility managers to diagnose critical systems, like pumps, fans, chillers, and HVAC (heating, ventilation and air conditioning) systems within commercial buildings. But it has since expanded service to noncritical machines, for which it provides continuous monitoring that’s used to provide an in-depth view of machine health, developing issues, and suggested maintenance practices. Augury claims it’s able to reduce breakdowns by 75 percent, increase uptime by 45 percent, and lower asset costs by 30 percent by spotting the earliest signs of breakage. Technicians have used its smartphone app to save over 3,000 machines, monitor more than 60,000 industrial and commercial appliances, and avoid over 7,000 failures. In one case, Augury managed to diagnose a crack in a rotor bar that, left unchecked, would have necessitated replacing the entire motor. “As the market continues to evolve rapidly on its journey to digital transformation, more enterprises seek to uncover blind spots in their operations with AI-based machine health solutions,” Yoskovitz said. To be clear, predictive maintenance solutions like Augury’s aren’t new. They’ve been used for decades in jet engines and gas turbines, and competitors like GE Digital’s Predix and startup Petasense offer similar Wi-Fi-enabled, cloud- and AI-driven vibration sensors. Some companies even perform the service in-house, like Gogo, which records in-aircraft servers’ fan speeds — an indicator of their temperature — to build decision trees for Gogo’s server operators on the ground and help predict equipment failures. It’s a well-established market — according to a recent report by analysts at the McKinsey Global Institute, predictive factory maintenance could be a $1.2 billion to $3.7 billion business by 2025. But Yoskovitz has grand visions for Augury’s technology, which he hopes will one day be built into consumer appliances, like washing machines and electric ovens.